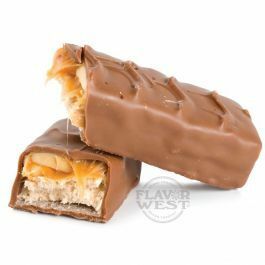 You can taste the layers of roasted peanuts, caramel, and nougat covered in milk chocolate when you add this flavor to any treats. This flavor fusion will leave you wanting more. Type: Candy Bar Water Soluble Flavoring. Ingredients: Natural and Artificial Flavoring and Propylene Glycol. USP Kosher Grade Flavoring. Usage Rate: 15-20% for E-use. Flavor suitability: Desserts, pastries and baked treats, yogurt, ice cream, candy and more. Specific Gravity: 1.06 No Refunds on Flavoring.